This absolutely stunning, detached bungalow, in cul de sac position, on a larger than average plot with flexible living throughout is offered for sale in move into condition & has the added benefit of no upward chain. Spacious & tastefully decorated throughout you begin at the front door which leads into the porch & entrance hall, having doors to all rooms. The lounge has a window to the front aspect & has a electric fire with feature surround making it a lovely room for relaxing. The dining kitchen is fitted with a range of modern wall and base units, has a stainless steel sink drainer with mixer tap, integrated electric oven & hob with extractor over, fridge freezer & dishwasher & plumbing for a washing machine. The dining area has room for a table & chairs for relaxed family dining but if you do prefer a more formal place you can do so in the dining room. The dining room has ample space for a table & chairs for all important family meals and entertaining with french doors allowing the feeling of bringing the outside in through the summer months, a electric fire with feature surround makes it cosy in the cooler months. 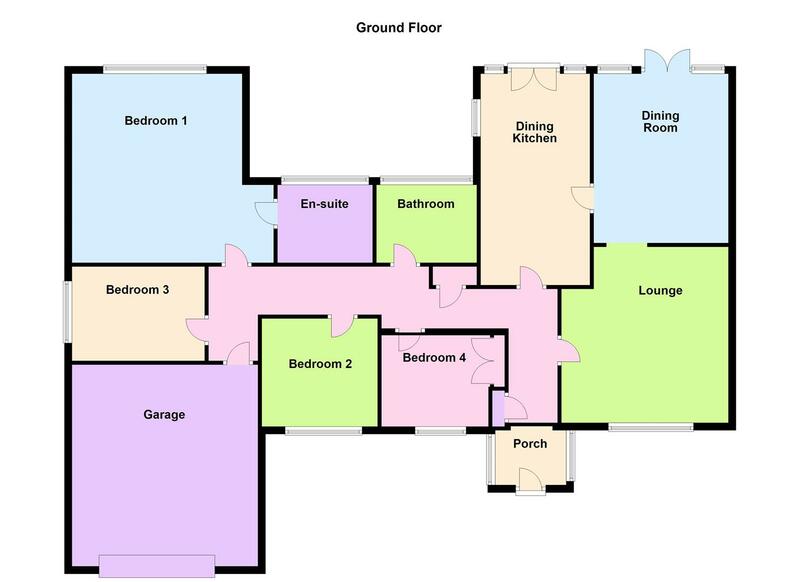 All four bedrooms are a good size and bedroom four has inbuilt wardrobes. The ensuite to master is fitted with a low level wc, wash hand basin and shower cubicle. The bathroom is fitted with a white three piece suite comprising of low level wc, wash hand basin and bath with shower over. Externally this home sits on a wonderful plot with a driveway providing ample off road parking leading to the double garage which has an up and over door power & lighting. To the rear the landscaped, south facing garden has a lawned area, flowered borders and many patio areas perfect for outside entertaining in the warmer months. Viewing is essential to appreciate not only the accommodation on offer but the care and attention to detail used creating a home to be proud of.